Some people develop elaborate backstories for their paper doll designs. I’ve always wished my brain worked that way, but generally I end up tapping into my history background. So, I find my inspiration for each fantasy dress design there. 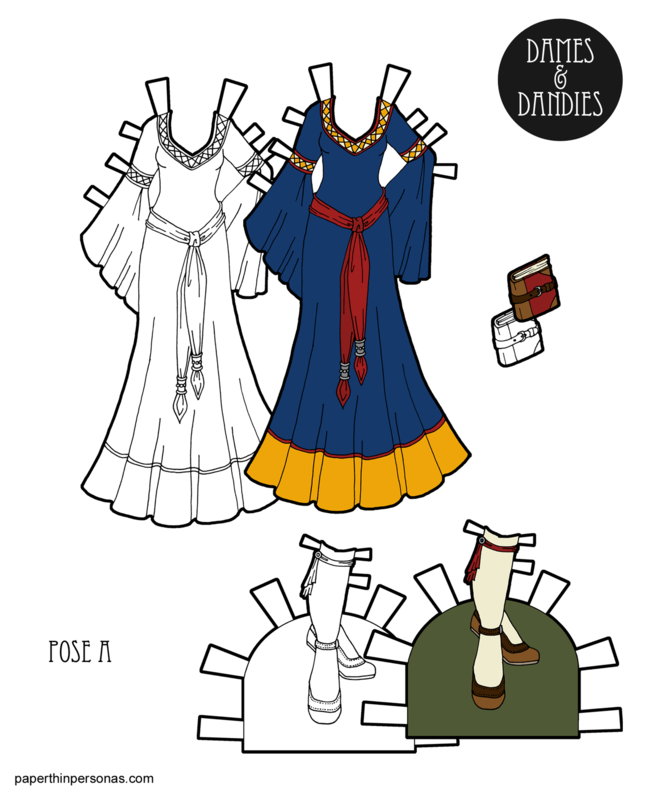 For today’s paper doll design, I was thinking of 14th century medieval dresses of Europe. Dresses back then usually had a kirtle (under-dress) which as worn with a surcoat (over-dress) on top. When I was working on this fantasy dress design, I wanted an over-dress that would feel more decorated than the under-dress. Basically, the opposite of putting children wore pinafores in the 19th century to keep their dresses clean. Her chain belt owes something to the 12th century and the leather pouch I copied from this one I saw on Pinterest. I have no idea if that chain belt set up would work in the real world (I suspect not), but I did think it looked neat. And looking neat is really a more important priority in my paper doll drawing universe. So, I’ve decided to take on The 100 Day Project on Instagram. Basically, I am drawing one dress a day (or more realistically several dresses and spacing them out over several days- I know me) for the next 100 days. If you don’t already follow me on Instagram, you can here. You can also follow the hashtag #100dressesproject if you want to just see what I’ve drawn so far. Will some of these become paper doll dresses later? I deeply suspect so. But I’m intentionally only spending a few minutes per dress. My goal is under 10 minutes, because this is a thing I’m doing on the side. It is not my life. Need a paper doll for today’s clothing? All the B Pose Dolls & Clothing. Printable Black & White PDF Printable Color PDF More Paper Dolls & ClothesHappy Valentine’s Day! 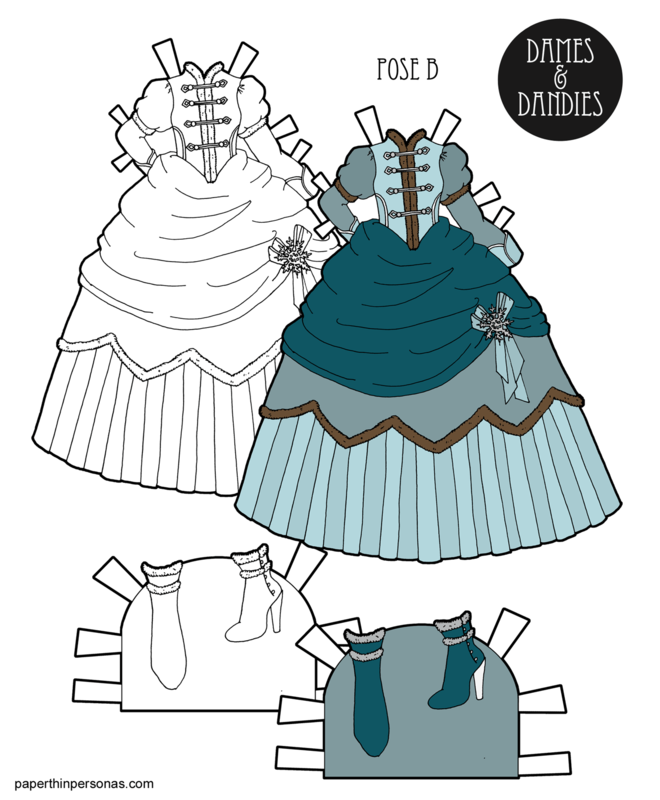 Since the Dames & Dandies are a new series, one of my goals is to try to get a paper doll outfit done for the holidays. I know I’ve mentioned this before, but when I was a child, my grandmother would send us holiday cards with paper dolls in them all the time. Here is a scan of one, I remember getting. I’m sure it says something about me that I can remember that card after 20 something years. 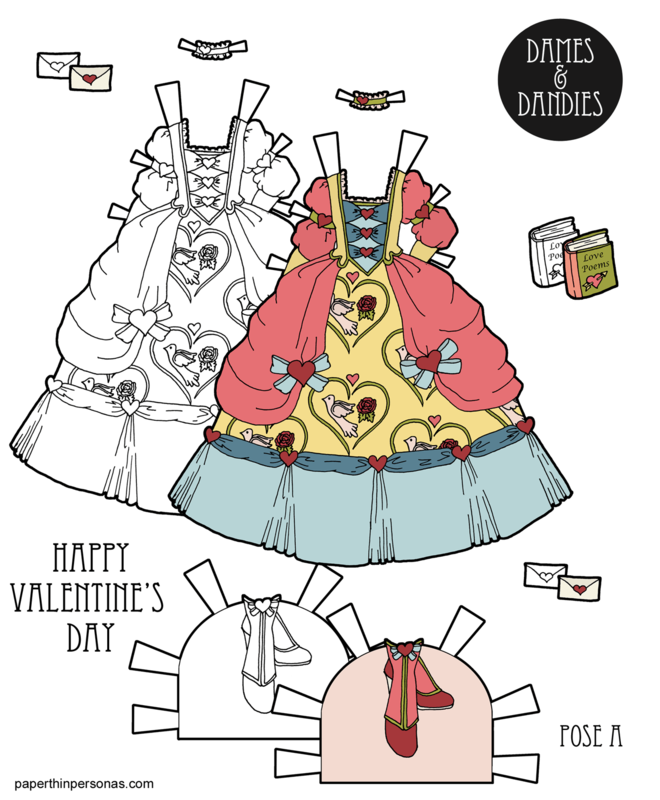 Anyhow, I love drawing over the top heart covered gowns for Valentine’s Day paper dolls. So, it wasn’t hard to decide to draw this one. I’ve been working on an 18th century paper doll with period underwear, so I thought I would design a dress that could go over the set of hoops. That’s how we ended up with this over the top rococo influenced Valentine’s Day paper doll dress. By the way, I have no idea when that 18th century doll will be done. So, don’t hold your breath. Meanwhile, I hope everyone has an amazing Valentine’s Day! For those of you who don’t know, “big gown” is my short hand for these sorts of full skirted over the top dresses I am fond of drawing. Wenesday’s Valentine’s Day dress is another “big gown”. I just like to draw things with huge skirts, because the size of the skirt allows for layering and over skirts and all sorts of other decorative elements. It’s hard to draw a super over the top mini-dress. You just don’t have as much room. So, anyway, I wanted to create a winter princess dress. You know, a sort of over the top, full skirted dress that would feel like the sort of thing a fairy tale princess might wear while wandering through a snow covered landscape. Possibly to meet a prince or possibly just because, she felt like it. Princes need not always be involved. Today’s winter princess dress is trimmed in fur. The bodice feels a little military influenced, with the trimming, buttons and cuffs. The skirt is three layers. There’s an over skirt, an under skirt and a wide pleated bottom skirt. The motif on the over skirt is supposed to be a snowflake, but I’m not sure that’s obvious. In fact, the first color scheme had a gold snowflake and it looked more like a star to me. So, I ended up recoloring the whole dress. I was thinking of snowy winter days when I colored this- blue-grey is a color I associate with the winter time. You can see the first color scheme over on the Patreon page. Let me know which color scheme you liked better. I’m super curious. 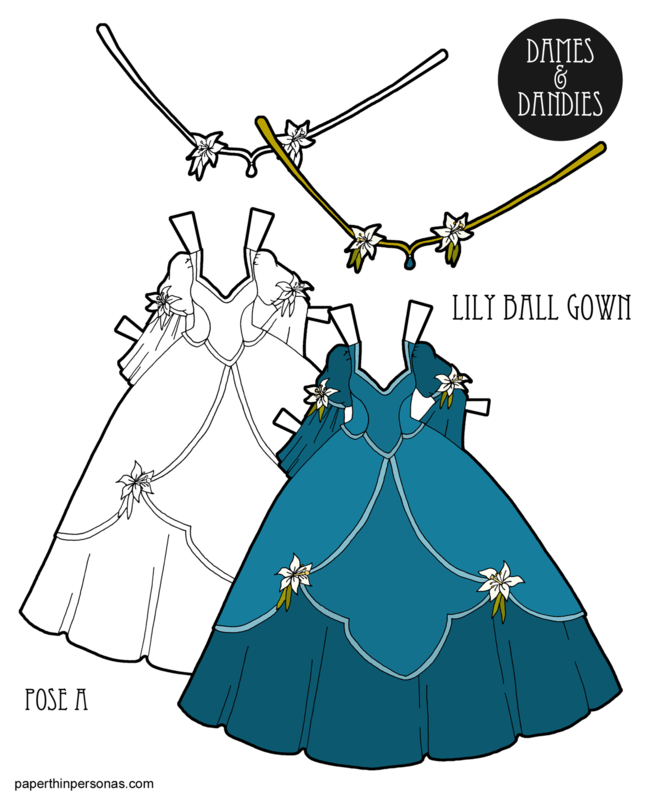 Printable Black & White PDF Printable Color PDF More Paper Dolls & ClothesThe first dress I designed was the lily ball gown, but this dress is what turned that dress from just as “this would be fun to draw” into a “oh, I could make this a series”. So, I really think of today’s Beatrix princess paper doll as the inspiration behind the whole week. When I was planning the Dames and Dandies series, I new I was going to have a stable set of “faces”, but I wanted those faces to have many versions. So, this is Version 2 of Beatrix– The Bellflower Princess Paper Doll version. Also, huge shout out to my Mom, who when I was describing the flower I was remembering from the garden as a child, recalled the name of it and spelled it correctly enough for me to goggle it. The formal name for bellflowers is Campanula, by the way, which is what she told me. I just thought Campanula Princess didn’t roll off the tongue as well as Bellflower Princess, hence the name change. The original doodles for today’s printable paper doll from my notebook. The doll’s head is on the right and the dress is on the left. 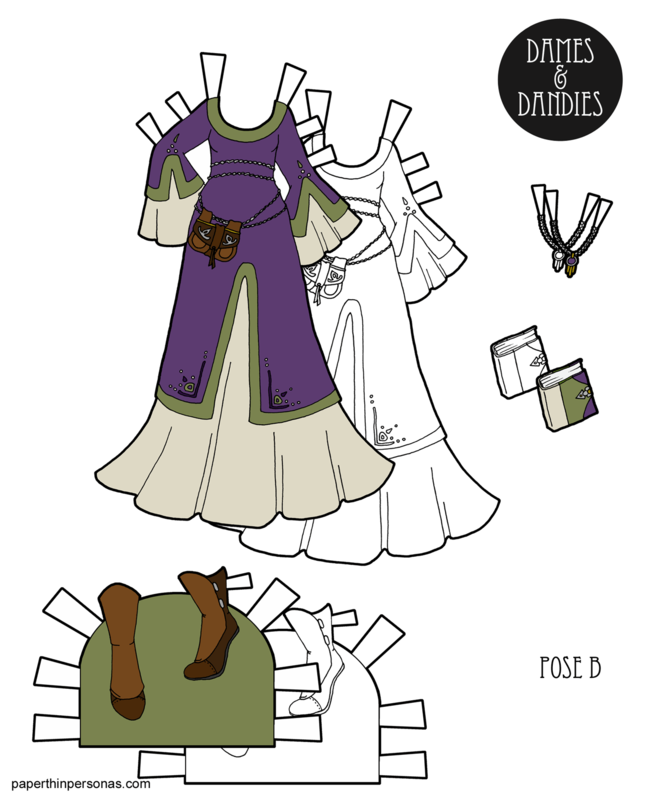 In the order of this princess paper doll design, the dress came first. Once I had it drawn, I wanted a crown and I came up with the idea of the flowers coming out from a pair of buns. Once I had that idea in my head, I had to figure out how to actually create in a way that would work for someone cutting out the paper doll. So, I drew the hair style and the crown pieces separately. Than, I used Photoshop to create one version of Beatrix with out the crown and second version with the crown. So, the hair with the crown can be cut out and placed over the hair without the crown. This also assures that this version of Beatrix can wear a hat without floral crown pieces getting in the way. I don’t often share my process photos here, because I try to save them for my Patrons. So, if you want to see more images of the raw beginnings of paper doll sets, than donate and join Patreon. I try to post a few “behind the scenes” images every month. I also put them up on Instagram erratically. In case you missed any of this week’s floral ball. The first dress was Monday’s lily ball gown, the second was Wednesday’s fiddlehead fern suit and then today, we have the bellflower princess. Let me know what you think of today’s paper doll in a comment or which paper doll from the floral ball was your favorite? I confess I don’t have one this time and usually I do. It feels at this time of the year as though Spring will never come. The weather in Alabama has been unusually cold and while I try to look at the bright side (fewer bugs), it has been a long grey winter. So, let’s look at paper doll clothing inspired by flowers. This whole week will be devoted to the floral fantasy ball. 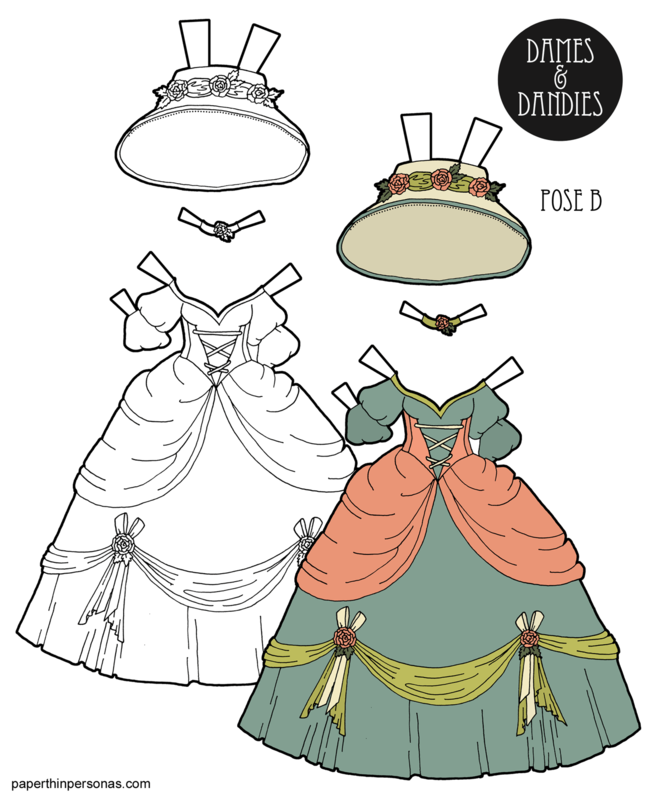 Today, we have a Lily ballgown for the A pose paper dolls. Wednesday will be a Fiddlehead Fern inspired suit for the C pose gents. Friday Beatrix will debut as the bellflower princess with her own paper doll princess dress. I love lilies. There were a bunch of yellow and orange lilies that grew by the door of our house when I was child. My mother is a wonderful gardener, but nothing else would grow in that corner. Those lilies grew there when we bought the house. As far as I know they are still there. I wanted this paper doll princess dress to be elegant. It was also a chance to practice drawing lillies. I didn’t want the paper doll dress to feel to bridal, so I chose a rich color. It started out as purple, but I changed it to teal once I realized I was going to end up with two purple dresses if I kept it purple. Anyway, to talk about the paper doll gown, I wanted to design this gown for weeks. 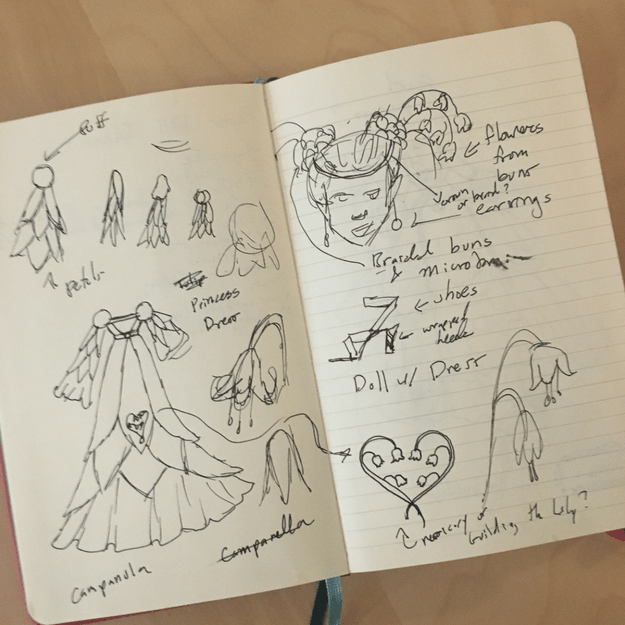 I originally doodled it out in my notebook and I knew I wanted to make it a huge skirted sort of ballgown. The crown was partly inspired by something sort of Art Nouveau. Hop over to the Patreon page to see the original thumbnail doodle I did of this gown and the subsquent sketchbook pages. Also, just for Patrons, there is a super fun purple version. I’m curious. What are some of your favorite flowers? I love lilies, pansies and poppies. How about you? Share in a comment! And maybe you’ll inspire another paper doll princess dress. It’s hard to know with what paper doll dress to start a new paper doll series. It’s full of both excitement and worry. I decided to make the first outfit in the series a classic fantasy gown design. It’s actually the first gown I drew for the new series after I had the dolls finished, so I suppose it is a fitting place to begin. I picked a rich dark blue as the primary color scheme for the gown with red and ocher. It should come as no surprise that her accessory is a book. I do love drawing books for my paper dolls. It’s the librarian in me. The garters are very decorative and I don’t know how practical they would be, but they do look nice. Inspiration wise, the fantasy gown design owes a little to the 12th century dresses like the bliaut, but there wasn’t a specific gown I based today’s dress off of. If you’re not sure what a bliaut is, than picture the stereotypical medieval dress and you’re pretty much there. Historical bliaut’s were more loose and less fitted. Meanwhile, I’ve got an alternative color scheme for today’s gown over on the Patreon page for my patrons to check out. Join if you’d like to support the blog! As always, I would love to hear what you think in a comment.